Learn More: Full descriptions and responsibilities of each open position are available in each titles link. 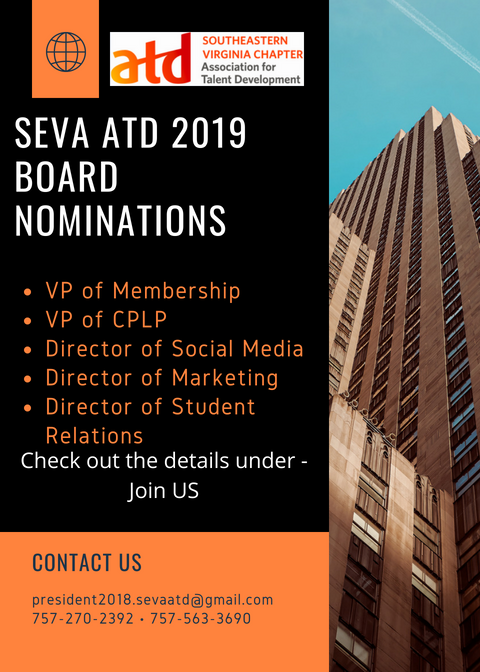 Your SEVA ATD Chapter is seeking talent to dedicate and develop their leadership, management, and relationship skills in the training industry. Joining the Board of Directors gives you the opportunity to serve in a leadership capacity by growing, connecting, and increasing the learning of our vibrant Hampton Roads workplace learning community. It’s a way to give back to your profession, to develop your own leadership skills working with volunteers, and for our membership to have a talented group of SEVA ATD talent shaping our profession. Nominees are now welcomed to complete the nomination board application with supporting documents, after which the slate of nominees will be open for vote by the chapter membership. Voting will take place September 10th - September 13th. Winners will be announced on September 14th. The SEVA ATD Board of Directors is a talented group of people, and it’s my honor to serve with, and learn from them – not to mention all of the interactions with our fabulous membership! Passion, talent, skills, and good intentions are present in all of our Board of Directors, and we’d love to have you consider joining this team for the betterment of yourselves, your peers and our chapter. If you have any questions, or would like to have an in-depth conversation about which role may be best suited for your talents and passions, please don’t hesitate to contact me. Thank you for all that you do for our chapter!